At the end of April, two teams from the Kansas City based nonprofit aSTEAM Village earned the opportunity to compete at one national and one international robotics competition. aSTEAM Village is an educational non profit whose mission is to “inspire students and families to pursue education and career pathways in Science, Technology, Engineering, Arts and Math.” CEO William Wells is an active member of Kansas City’s Coalition for Digital Inclusion, and worked with Kansas City Digital Drive’s Katherine Hambrick to tell aSTEAM’s story. 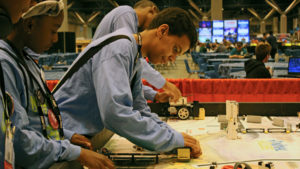 The FIRST World’s Robotics Competition was held in St. Louis, MO April 26-29 and aSTEAM Village competed in the First Lego League Junior competition against countries from all over the world. 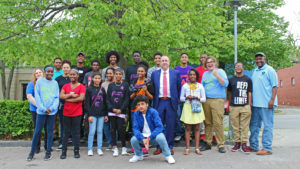 The group, called the NSBENeers, included 10 kids grades 4-8, from a variety of elementary and middle schools across the city, such as Lincoln College Preparatory, Benjamin Banneker and Central Academy of Excellence. 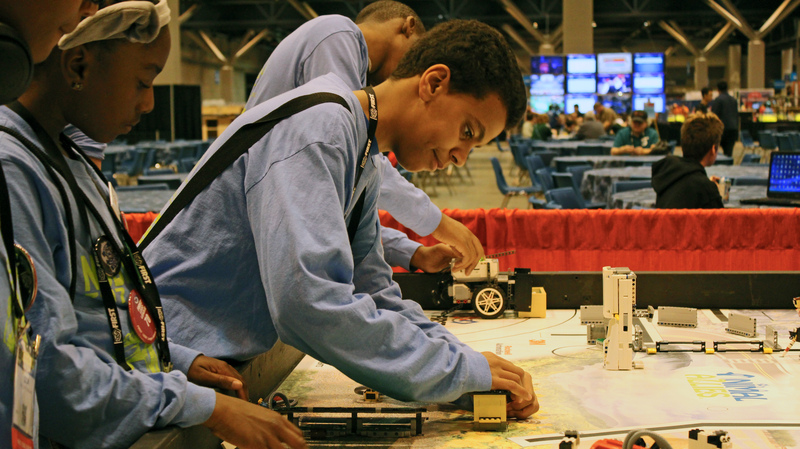 Though many schools in the Kansas City area participate in robotics competitions and even advance to the national and world competitions, these kids prefer the team at aSTEAM Village. The aSTEAM Village team set up their Legos to practice before competition at the FIRST World Festival Invitation on Thursday April 27, 2017. Immediately following the FIRST World’s Festival was the 10th annual National Ten80 Racing Competition in Troy, NY. The car racing competition was put on by the National STEM League Renssaler Polytechnic Institute on Saturday April 29. Each team builds a robotic racing car proceeding the Ten80 competition that can take commands from a remote control. The aSTEAM Village team had eight high school students from a variety of Kansas City high schools – like Central Academy and DeLaSalle – competing as the Alpha Omega Racers in the national finals. The team even garnered enough points in the first two rounds to advance to the third and final leg of the competition. Both teams earned the opportunity to compete through the National Society of Black Engineers VEX Robotics Competition in March. Katherine Hambrick followed the students journey to St. Louis and Troy and will continue to tell their story in the coming months.